On August 24, 2006 the IAU stripped Pluto of its status as a planet - instead it is now classified as a "dwarf planet." Read about the details on my Blog. The Applied Physics Laboratory (one of the lead investigators of the New Horizons project) announced the official names of Pluto's second and third moon: Nix and Hydra. This means Pluto now has three moons. More details below. Clyde W. Tombaugh, staff member at the Lowell Observatory, discovered Pluto on February 18, 1930. The process was painful, the result of "blinking" where two photographic plates are compared against each other to look for any changes in object appearance and position. Our knowledge of Pluto comes as a result of mathematic and spectroscopy. We know that Pluto is composed of the same rock-ice material as the moons of Uranus and Neptune. It is likely that Pluto's surface contains a combination of carbon dioxide ice, methane ice, and nitrogen ice. Pluto may have two additional moons, which could make 3 moons for Pluto. 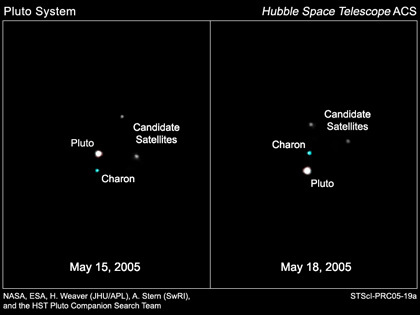 Observations using the Hubble Space Telescope in May of 2005 demonstrated two candidates. More details can be found at the Hubble Space Telescope website. What is surprising about Pluto is that it has a moon - sort of. The moon of Pluto - called Charon - was discovered in 1978. The composition of Charon is thought to be identical to Pluto. The current idea is that Charon is not a moon, but a member of the Pluto-Charon system (a binary planet). Charon does not orbit Pluto and Pluto does not orbit Charon. Instead, the both rotate about a common point. These issues will hopefully be answered when the New Horizons probe arrives at Pluto. The discovery team responsible for the New Horizons project also discovered (its official now) the two additional satellites in May of 2005. What is more remarkable is the tool used to discover the moons: the Hubble Space Telescope. 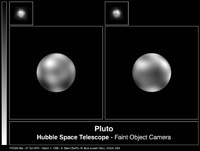 The two new moons are 5000 times more faint than Pluto and two to three times the Pluto-Charon distance. The team initially names the moons Nyx S/2005 P2 and Hydra S/2005 P1. Nyx was renamed to Nix by the IAU since asteroid 3908 bears the name Nyx (the name of the Greek goddess of darkness and night). Nix is the Egyptian equivalent to Nyx. Hydra is the mythological sea serpent with nine heads. A bit of trivia: the first two letters of Pluto (P and L) is used to honor Percival Lowell who motivated the search for Pluto. In addition, the first letters of Nix and Hydra are used to honor the New Horizons mission and the Hubble Space Telescope (the letters N and H). Hydra is the brighter (possibly larger) outer moon while Nix is the dimmer (possibly smaller) middle moon (Charon is closest to Pluto and the brightest moon). The orbit's of Nix and Hydra are near circular and are on the same plane as Charon - but at greater distance. 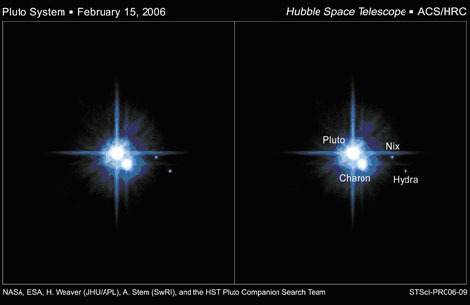 This demonstrates a possible common origin of Charon, Nix and Hydra - the result of a large impact of some object with Pluto. Astronomers will point their telescopes toward these two new moons in order to learn their properties. In addition, the arrival of New Horizons in 2015 will provide detailed mapping.